You wouldn’t believe it…but I chose to spend my summer in Australia. I couldn’t believe it myself, but there you have it….The most un0orthodox decision I have ever made with regards to Australia. 1)Malas laa nak pack barang letak dlm storage and then later nak transfer barang from storage back to uni. And then nak arrange the room all over again…and all for the sake of another year of school ONLY. Like…all the (sweaty) effort just for another year? 2)Next year, insyaAllah, will be the last year of medicine. So, I just want to travel and see places ENOUGH so that I could put all these behind me properly once I leave Australia permanently. Because once I leave Australia, I don’t plan to come back. If I got too much money than I know what to do with (entah bila ia akan berlaku, hahha) I might as well travel to other places I haven’t been yet, right? I am just too LAZY to go through all the fuss for only ONE YEAR. And for that, I am paying a lot. I know it was a very un-wise decision, economically, but I really couldn’t be bothered to think too much about money. I mean, I am not rich and I don’t have lots of money in the bank, but I have enough to live nicely and comfortably and not starved. And for someone who don’t need much in life, it’s enough. I don’t like to worry about money. I don’t like to worry about not having enough money. And when having enough money, worry about saving up more. That’s just too much worries than I could handle, lol. So whatever money I have, I spent them exactly as I need…aku tak pernah nak pulun save beriya-iya but at the same time I don’t spend them frivorously on brands or electronic gadgets that would change every six months. I don’t even spend them on clothes. So, people sometimes wonder where did my money go? Because I don’t have this cool electronic gadgets or this amazingly gorgeous outfit to show for my dwindling bank account. I don’t have any branded handbags or shoes to show for my lack of savings in the bank. Because all my spendings are in the things that you could not see…or even if you could see them (like my books) you don’t appreciate them or value them the way that I do. But the thing is, I like how I spend my money. And even though some people think that I am not wise in my economy, I just could not change the habit of a life time. So, again, this summer I spend my money on the invisible….the expensive accommodation in exchange for a comfortable life of tidak merempat di rumah orang. I hate cramming at other people’s houses. Macam mana mahal pun, I want my own things around me, just within my reach just in case I need it! Cuti sampai sebulan lebih…takkan nak merempat rumah orang sampai sebulan kot! It’s just not me. I am just not comforatble with the kind of life that is too different than my normal life. I am a very rigid, unbending person…I like things the way they have always been. In those times when deviation from the norm do occur, there would be a threshold limit to the deviation, beyond which I would be loathed to bear it. My rigidity can be both an advantage and a disadvantage. Wani just called me to say that the summer job has been confirmed…and we’ll leave for Orange, next Monday insya Allah. But Izati is planning to come…and even though we’ve already agreed that if I got a job faster than she could come, I’ll go for the job. But still…it’s such a shame that I don’t get to see her when she’s touring Australia. I was also thinking of the civilization I would leave behind when I go to Orange. I always know that I don’t need to be rich because I don’t need to live luxuriously…but I want a comfortable life with basic necessities that serve their function. Sleeping in a tent, complete with communal shower and working under the heat does not sound too comfortable for me. And while the extra money is kind of gooood (oh soo good)…but it’s not like I am desperate for the money. Maybe I can work for like 3 days…thinking like, “This is camping! !” but for the whole month? Ehem ehem…cam tak boleh jer. 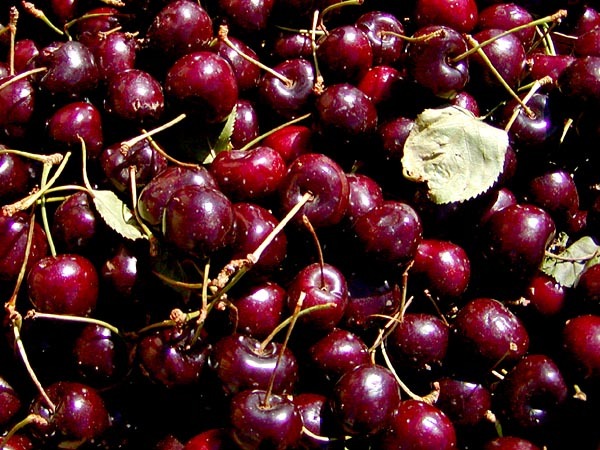 Picking cherries may be fun, initially, especially since we are allowed to eat them as we pick…however, when the boredom sets in…will I be able to bear it under the EXTREME summer heat? Well, I guess this is the usual case of me worrying too much before deciding to do anything different. I really should be more flexible… I know. But I couldn’t help it. I go through all these possibilities that could go wrong before I can truly decide to do something. And the fact that what I am planning to do is not going to be very comfortable, makes it even harder for me to feel good about it. Maybe all I should do is just go ahead and just DO it and worry about it later. Amidst all these worries and consideration, there exist a small thrill of excitement as I ponder the adventure that lies ahead of me for the next few weeks. And that little thrill of embarking on a new unexplored life territories makes it ALMOST worth all these worries of saying good bye to all the trappings of civilization as I have known it. And now, let’s say hello to the future cherries waiting for my dainty little fingers to pick. Hello Cherries! I can't wait to eat you for free!